Search Results for "meat packing"
The process of making sausages. Filling the intestine with minced meat. Shop at the meat-packing plant. Hands form sausages, bind them with a rope. Live cows are inspected by a meat packing inspector who examines each one before their slaughter in the 1940s. 1950s - Two Minnesota farm boys write to Hormel meat packing plant after watching a freight train pass by and then get their wish to visit. The process of making sausages at a meat-packing plant. 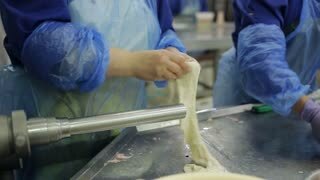 Workers in uniform make sausage. Cows on the conveyor belt, 4K. Seamless loop, green screen. Pork carcasses against the background of a meat-packing plant. production line at the meat-packing plant. Fresh pieces of pork and beef meat are processed. production of sausage and sausages. meat products. 1950s: Chef lifts rib roast from oven to plate. Sides of pork hang from hooks on conveyor. Meat packers carve pork meat on disassembly line. 1950s: Men move and inspect sides of beef. Sides of pork move along hook conveyor. Machine pumps and packages lard. 1950s: Sheep feed from troughs. Cattle in large stockyard. Trucks and cars drive by meat packing plant. Man walks from garage of meat packing plant. 1950s: Man pumps oil into machinery. Men corral hogs down ramp and into meat packing facility. Meat comes from a bucket at a meat packing factory. Inspectors must look at the viscera with special attention in a meat packing plant in the 1940s. Inspectors look at commercial cuts with a specific look at ham in a meat packing plant in the 1940s. 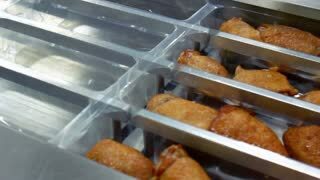 A top view on minced meat packing process.